Have you just found out you're going to be a dad, or perhaps you're already a brand new dad? 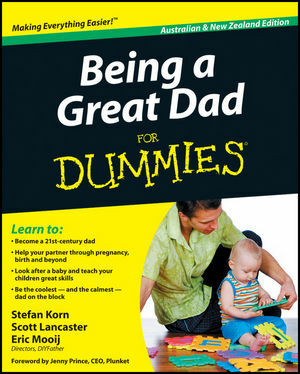 Being a Great Dad is a comprehensive and practical guide to For Dummies dadhood, with advice on topics ranging from conception to looking after your baby, connecting with your little one and helping your child develop and grow. DIYFather.com has become one of the most recognised organisations promoting active fatherhood in Australia and New Zealand. DIYFather.com was brought into this world by Wellington-based dads Stefan Korn, Scott Lancaster and Eric Mooij, who recognised the need for social innovation in the fathering space. DIYFather is a social enterprise that aims to help men become the best fathers they can be. The directors of DIYFather have been recognised for their work by winning the 2009 New Zealander of the Year award in the education category. Stefan Korn is a New Zealand-based internet entrepreneur. He is passionate about e-commerce and the web, and in general loves getting involved in new businesses. His wife Raquel gave birth to their son Noah in May 2007 and the experience of becoming a father, as well as the challenges of looking after Noah, prompted him to join DIYFather. Stefan has a PhD in Artificial Intelligence and an MBA in international business. Before becoming an entrepreneur Stefan held senior management roles for large international corporations in the IT, Telecommunication and Hospitality sector. In addition to DIYFather, Stefan runs an investment company for online startups, WebFund. Stefan is also actively engaged in community projects and enjoys tutoring for Wellington Community Education. Scott Lancaster is the founder of DIYFather.com. He is married to Renee, who gave birth to their daughter Pyper in July 2007. After discovering what little parenting information was available for fathers, Scott approached the other two directors, who helped him build DIYFather. Scott looked after Pyper full-time for the fi rst two years of her life and experienced being a stay-at-home dad (SAHD). Scott has an Applied Science degree majoring in Agriculture and comes from a farming background. Eric Mooij is married to Andrea, who welcomed baby Ava into the world in April 2008. Eric is also father to Nastassja (16), Christian (15) and Amber (14). Although he is not living with his three older children, Eric has regular contact with them and supports them in every way possible. Eric is keen to make a stand for separated families. Coming from a broken family himself and having relived this experience with his fi rst three children, he works hard to be a positive role model. Outside of DIYFather, Eric works in IT and project management. Part I: From Here to Paternity: Conception to Birth. Chapter 3: Pregnancy: A Drama in Three Acts. Chapter 4: Preparing for a Baby in the House. Part II: The First Year. Chapter 6: Being Dad to a Newborn. Chapter 7: The First Three Months. Chapter 8: Months Three to Six. Chapter 9: Months Six to Twelve. Part III: The Toddler Years. Chapter 10: Toddling Towards Two: Months 12–24. Chapter 11: Charging Towards Three: Months 24–36. Chapter 12: More Babies: Brothers and Sisters. Part IV: The Preschool Years. Chapter 13: Fun and Games. Chapter 14: Health and Nutrition. Part V: What Happens When. Chapter 17: Serious Illness and Losing Your Baby. Chapter 18: Disabilities, Disorders and Special Conditions. Chapter 19: Divorce and Separation. Chapter 20: Ten Ways to Improve Your Partner’s Pregnancy Experience. Chapter 21: Ten Ways to Bond with Your Newborn Baby. Chapter 22: Ten Ways to Engage with a Toddler.